Elly Blue and Joe Biel returned to BicycleSPACE Downtown for another great event during the National Bike Summit. Elly and Joe, of Microcosm Publishing, have been active in creating books, zines, and films centered around the intersection of bikes, transportation, gender, sexuality, race and class. Biel started Microcosm Publishing from his closet in Ohio over 20 years ago, in part as an outlet for depression. Today, Elly and Joe led “Put Your Road Rage to the Page,” a writing workshop and discussion on how to channel your frustrations in something positive. Attendees included locals, experienced commuters, new cyclists, a Lyft driver who bikes, a bike advocacy organizer from Cleveland, and a self-described “California bike industry shill,” from the lovely Merry Sales Co. 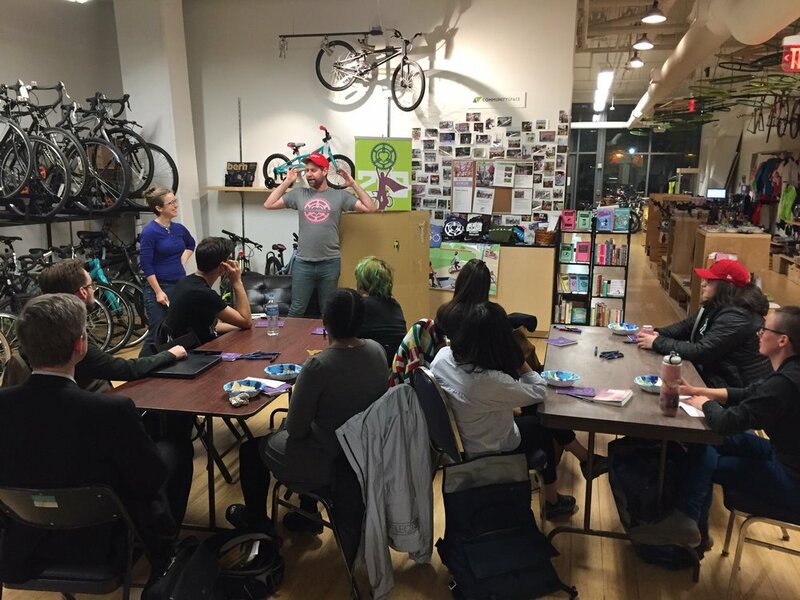 The group enjoyed a passionate discussion where they wrote and shared personal stories that made them upset and frustrated, but also ways they find joy and inspiration in the bike world. Some criticisms we’re of the usual suspects, poor infrastructure and rude behaviors from drivers. Critiques also fell on the cycling community as well. Folks felt frustrated when those on bikes treated each other in negative ways, “shoaling” at lights, talking down to other genders, elitism, and erratic behavior that hurts the public image. The consensus was that these issues aren’t specific to the bike community, but relate to society at large. They discussed ways we can shift our attitudes towards empathy and compassion. Such as not assuming you know what’s best for others, instead they emphasized the power of getting to know people first and learn who they are. There was lots of support for random acts of kindness and micro-affections. Elly and Joe had folks compile a list of problems and solutions. Together the group came up with ways to work toward positive, productive outcomes within “your agency and locus of control.” The group got to know each other and shared stories from their own facets of the bike community. It’s always a pleasure hosting Elly and Joe and we can’t wait to see them again. Check out their site to learn more about their great work. Learn more about Bike to Brooklyn. Bikes help connect you to what you love. Much of the Washington Women's Rugby Football Club, DC Furies, ride to weekly practices at Gallaudet University. Founded in 1978, DC Furies is one of the oldest women's clubs in the country. Beginning with 5 women, the club now has 60 members, many of which compete at the elite level in the Women's Premiere League. The Furies host the largest Spring Rugby Tournament, Ruggerfest, in the country next weekend, April 16th and 17th. Check it out! How does your bike connect you to your passion? Let us know in the comments. Thanks everyone for sharing your photos of our Grand Opening this weekend. Our photo contest winner is Kevin @bicyclebug for his town and country Brompton photos. Kevin visited Oxon Hill Farm, the fountain at Bartholdi Park, and our Downtown shop at 440 K Street. When we say you made our double grand opening amazing and awesome, we mean it definitively. The words are used so often that it's easy to forget their root meanings. Amazing and awesome. Suffice it to say we're inspired by a sense of wonder, gratitude and heartfelt appreciation for your support. You've gone home with lots and lots and lots of exciting new bikes. This makes us happy unto itself and even more happy to know we'll see you back for regular check-ups. And happier still to see you again to redeem your 10% back gift certificates. One thing we learned from our time in the pop-up shop at 5th and G Streets is that home is where the heart is. You came to us and continued to consider us your community bike shop under the most crowded, disorderly and challenging circumstances. Voting with your feet, you proved you most value our BicycleSPACE community and we couldn't be happier. You proved it yet again during our grand opening. If we couldn't locate something right away or there was a wait for a salesperson or mechanic, you were the consummate diplomat. We noticed and appreciate your resilience. Thanks to all our loyal customers who brought their own friends to our shops to introduce them to the BicycleSPACE difference. We made new friends and benefitted from existing relationships during this eventful weekend. We send sincere thanks to these individuals and businesses. Tryst donated three platters of food on Saturday afternoon, plus five gift certificates to our raffle. Acme Pie Co. donated untold numbers of delectable pies to sweeten our Saturday. The CakeRoom Bakery was the icing on the cake Sunday morning. Earlybirds enjoyed delicious cupcakes the bakery donated. Mellow Mushroom warmed us midday Sunday with generous pizza donations. Songbyrd Music House & Record Cafe filled our vast SPACE with music for the coolest cats in Adams Morgan both Saturday and Sunday. Plus, they raffled seriously covetable prizes. Toro Mata hand-delivered flowers to us. They bought the lovely bouquet at neighboring Little Shop of Flowers. Roofers Union and a number of Adams Morgan residents welcomed us via social media. Bromptoneers, with BicycleSPACE co-owner Phil Koopman at left, paid a visit to our Mt. Vernon Triangle shop. From there, they rode to our Adams Morgan shop then lunched at Mellow Mushroom. The Brompton Bicycle Club created a Sunday event around our grand openings, visiting both shops then lunching at Mellow Mushroom to recycle bicyclists' consumer dollars back to a friendly business. The Adams Morgan Partnership Business Improvement District (AMPBID) hand-delivered the gift bags the Saturday earlybirds enjoyed. AMPBID has been a steadfast supporter all along. We tip our cycling caps to our Advisory Neighborhood Commission 1C for their statesmanship in welcoming us to the neighborhood. A Baked Joint donated gift certificates to our raffle. A Baked Joint and 5th Street Ace Hardware welcomed us to put flyers in their stores and sent good wishes via social media. Our bicyclist Ward 6 councilman, Charles Allen, paid us a visit on Sunday afternoon. Ward 6 Councilman Charles Allen, left, with BicycleSPACE co-owner Phil Koopman, gesturing so enthusiastically his hands are blurry. We love how a gorgeous Celeste Bianchi Milano Dama photobombs at right. The Mt. Vernon Triangle Community Improvement District and its marketing committee are supportive allies as we open shop. We tip our cycling caps to our Advisory Neighborhood Commission 6E for their statesmanship in welcoming us to the neighborhood. It takes a village to grow and sustain the largest bike shop in D.C. We sincerely thank our village people for investing in our amazing and awesome grand opening. Hills of Anacostia departs from 440 K St NW at 8 a.m.
Nice & Easy departs from both locations. Two simultaneous rides depart from 440 K St NW and 2424 18th St NW at 10 a.m.
Cupcake Ramble departs from 440 K St NW at 11:30 a.m. It ends with treats in Adams Morgan at 2424 18th St NW. City Explorers departs from 440 K St NW at 11:30 a.m. This will be our regular ride schedule from now on. Later this month, we're introducing a Hills of Rock Creek Park ride at 8 a.m. Sundays from Adams Morgan. Details coming soon! This one is truly a standout, so we're dedicating a post to share our valuable offer with you. Buy any bike and we'll email you a gift certificate for 10% of its value. Your $1,000 bike nets you a $100 gift certificate. This offer can be combined with 15% off bikes of $1,500 or more. Double dip during our Double Grand Opening! And, double dip again by doing your own personal Tour de BicycleSPACE. Shop in one location and show your receipt at the other location for 10% off your purchase (excluding bikes and labor). If you feel like you need a scorecard, you're right. We'll have printouts at each shop so you can see all our awesome offers on one page. The wait is over, friends. Our Adams Morgan and downtown shops are having a Double Grand Opening July 10-12, 2015. Friday: 10 a.m. - 7 p.m. | Saturday: 10 a.m. - 6 p.m. | Sunday: 11 a.m. - 6 p.m.
Friday: 10 a.m. - 7 p.m. | Saturday: 10 a.m. - 6 p.m. | Sunday: 11 a.m. - 5 p.m.
What's new? All about our new bikes and products. What about the weekend rides? Here's the schedule. Thank you for keeping the faith and believing that a better BicycleSPACE was on the horizon. What was once an abstraction of architectural renderings is now a brick-and-mortar reality. The shops are filling up with beautiful, durable, functional things and an eye-popping assortment of more bikes than ever before, e-bikes, clothes, shoes and so much more. The most important component is you, our dear friends. We can't wait to welcome you into our new homes. We'd love to see you at both shops and will reward you with a special offer: Show your receipt from one shop and get 10% off at the other (excluding bikes and labor). Sign up for our newsletter and follow us on social media for updates about our Double Grand Opening Extravaganza.